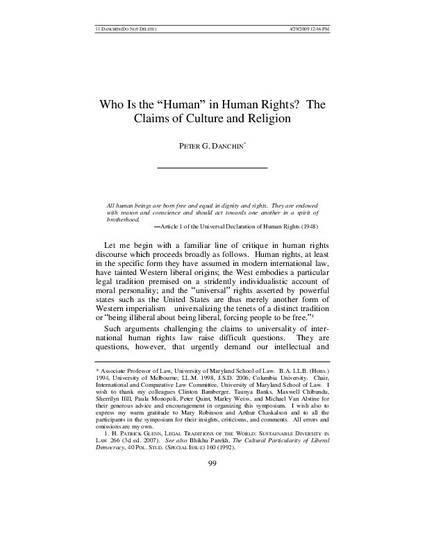 Modern critiques of international human rights law force us to confront at least two conceptual puzzles in the area of the claims of culture and religion. The first concerns the two concepts, often run together, of the secular (or secularism) and freedom, and the question of how rights—e.g. the right to freedom of conscience and religion—mediate between these purportedly universal or objective positions and the imagined subjective claims of particular religious or cultural norms. The second concerns the question of what we mean by “human equality” and how this idea relates to deeply-situated issues of collective identity and culture. Such claims raise complex and difficult conflicts between equality norms on the one hand, and religious and cultural freedom norms on the other. It is argued that a value pluralist approach to such questions opens the possibility of less dogmatic and binary accounts of reason and religion in viewing both as human institutions and social practices requiring modes of justification and accountability. This requires the constant search for forms of accommodation, mutual understanding, and overlapping consensus between actual religious communities and the normative claims of rights discourse understood in value pluralist and philosophically hermeneutic terms. In order for this to occur, however, the primary obstacle is the inability of Western rights theorists to see their culture as one amongst others. 24 Maryland Journal of International Law 94 (2009).